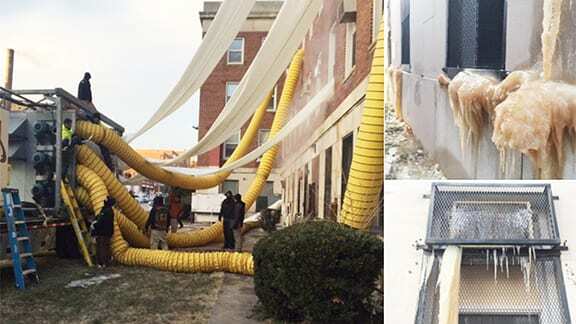 Cleanup was started immediately in early January on campus buildings at Howard University after frigid temperatures in the nation’s capitol earlier this month caused pipes in the university’s underground steam heating network to fracture spewing steam and causing mildew in several campus buildings. WASHINGTON, D.C. — Lots of school systems across the country, from elementary level through college, look forward to the winter breaks as a time to rest and refresh. In most cases, the winter breaks end and school resumes. One sign of things getting back to normal on many campuses is the familiar sight of steam billowing through the ventilators on grounds, sidewalks and streets. This school year has been one for the books for many, however, due to the mix of unexpected weather from forest fires in the West, to hurricanes in the South and along the Atlantic Coast to extremely harsh snowstorms and persistently frigid temperatures across the upper part of the nation from coast to coast. Some institutions were prepared for the normal dose of tough sledding. Not so for others. Howard University, the 150 year-old higher education powerhouse here definitely was not ready for the New Year. Today, Howard, a liberal arts peer of Fisk and Vanderbilt universities with some 10,000 students, is recovering from a major January 2nd steam heating system failure. It is rooted in a prolonged below freezing temperature dive that created widespread steam and moisture damage in several key buildings on the 80 structure campus. The fracturing of several main line steam pipes in the university’s vast underground network of steam pipes forced Howard to reopen a week later than scheduled this month. The rampant spewing of steam and moisture through several principal campus buildings forced their closure indefinitely. Once reopened, the steam and moisture damage forced the university to relocate more than 500 classes to undamaged rooms on campus for possibly the rest of this school year. The historic Howard University Hospital escaped damage from the disaster. Aside from scattered disruptions of heat, none of the housing dormitories were damaged or their use disrupted. Quick response by the facilities maintenance team and an outside contractor, helped reroute useable fixtures to the university hospital, a university spokesperson said. Officials at Howard say early assessments of damage suggest it will cost several million dollars to repair. Like Nashville’s Vanderbilt University, Howard relies heavily on a decades old steam power plant system to generate heat for most of its buildings, a Tennessee Tribune sampling of area institutions found. More than a decade ago, Meharry Medical College, which partners with Metro General Hospital (formerly Hubbard Hospital), stopped using central steam plant power for heat. Today, nearly all of Meharry’s heating and cooling systems operate building-by-building based on self-contained heating and cooling systems that can more easily be shut on and off as needed, said George Kelly director of facilities at Meharry. “We were lucky we didn’t have more breaks,” Kelly said, commenting on the Howard disaster and the fact that Meharry nor any other institutions in the Nashville area he knows of have experienced such major facility problems this year. “The extreme temperature was prolonged,” Kelly said, in offering thoughts that might help explain the Howard disaster. “It could have been worse” for Nashville which had its own cold snap this month, he said, adding ,“The city has survived. Kelly credits the steady conversion of older buildings to newer approaches used to heat and cool buildings with the decline in incidents of steam spewing from school grounds, sidewalks and streets. Mark Petty, assistant vice chancellor for plant operations at Vanderbilt, says the institution still relies on a massive network of underground steam pipes to heat on steam pipe system to heat its 12 million square feet of space in buildings around the campus. Vanderbilt’s co-generation power system makes some 400,000 pounds of steam an hour, he said, and can produce enough spare steam to make electric power to serve some campus facilities, reducing the school’s monthly bill from the Nashville Electric Service (NES). Petty said he knew no details of the Howard situation but, like colleague Kelly at Meharry, speculated the frigid temperatures may have played a role in the steam network’s breakdown. Maintaining steam pipe networks is very tedious, Petty said and demands consistent attention. Unexpected temperature dives in areas not prepared on a regular basis are more at risk, he said. Howard’s network of steam pipes is probably installed like most at institutions in warmer regions of the country. They are not buried as deeply in the ground, Kelly said, reflecting the fact there was no historic reason to protect them much as is the case in areas North of the Mason Dixon line. In Canada and more Northern cities across the U.S.A., the initial construction of the steam plants provided for construction of the network of distribution steam pipes to be located much deeper in the ground to avoid freezing surfaces. Howard is working hard to minimize the disruption of its program for the rest of the school year, said university vice president Crystal Brown. “We’ve had really aggressive efforts” to tackle the myriad challenges stemming from the winter surprise, she said. The responses from alumni, parents and well wishers, has been “warm and overwhelming,” Brown said. Among the 50 or more Tennesseans who claim Howard as their school, Nashvillian Jasmine Fleming, a legal communications major, characterized the disruption as a bump in the road. “Only one of my classes didn’t have heat on one day,” said Fleming, a 2015 graduate of Battle Ground Academy. “It got fixed,” she said.” Otherwise it was fine.” Fleming said the weather disaster didn’t get much attention on the group chat online site of Howard’s Tennessee Club. “At Howard, we face a lot of problems, but there was no talk about it (the winter storm disruption), because we’re used to it,” Fleming said.